I Buy Way Too Many Records Dot Com: Black Paw - Bait 7"
I've been missing the band Rumspringer for years. They were one of my favorite discoveries of the past ten years or so and I still have both of their albums in heavy rotation. It's so exciting to see Wes from Rumspringer with a new band called Black Paw. 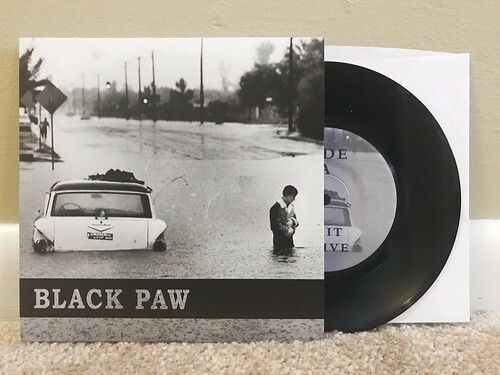 Formed from the ashes of the short lived New Colonies, Black Paw provide four songs of the sort of crunchy, melodic pop punk that I love. Black Paw is gruff without sacrificing the hooks and they are aggressive without losing sight of the melody. The four songs on this 7" are every bit as good as anything Rumspringer ever cranked out. I'm so thrilled it exists and the only issue I have is that there are only four songs. A fourteen song full length would be much better and would have certainly placed high on my records of the year list if the other theoretical songs were as good as the four on this 7". I have nothing further to add. This is excellent. Go buy it right now.